Music and communications technology collide. Ingenious musician Gordon Charlton has come up with a novel way of producing Theremin-style sounds, and all he requires is a pair of walkie-talkies. Charlton has posted a video of his 'invention' on YouTube - he simply turns the handsets on and moves them closer together and further apart. The pitch of the feedback that's created changes accordingly. That's all there is to it, really - there's no circuit-bending or other modification involved in this. 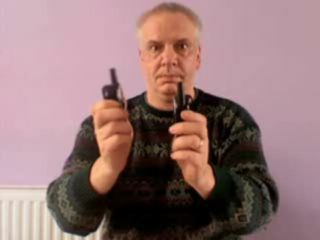 Gordon uses a pair of Binatone Latitude 150 walkie-talkies (pictured below) that you can pick up for less than £20, but presumably, any model would do. Next: making an analogue synth out of a food processor.